Do you like reading my blog? My attempt on Everest in April and May 2011 – will raise awareness and money to support 2 foundations – the Central Asian Institute (CAI) and the HUMANEITY Foundation. Both foundations support causes which I hope will make a positive difference to children’s lives. The idea of combining my climb with a community support element first really dawned as I was reading the book ‘Three Cups of Tea’, written by an American ex-mountaineer named Greg Mortenson. The book details Mortenson’s journey from mountaineer to setting up and running the Central Asian Institute (CAI). The CAI effectively builds schools in extremely remote area’s of Afghanistan and Pakistan, with a view to educating the woman within these communities. If you want to find out more please read one of Greg’s fascinating books (‘Three Cups of Tea’ or ‘Stones into Schools’). I am also working with the HUMANEITY foundation on a Youth Development Program. This program will give a group of Taranaki teenager’s, (my home province in New Zealand) the opportunity to travel to Cambodia to visit and work on various humanitarian projects for a two-week period. They will mix with their Cambodian peers and view first hand the struggle required on a daily basis that children born into third world environments face. When in New Zealand over Christmas, I met with the principal of Spotswood College in New Plymouth – Mr Mark Bowden to discuss the program in more detail. Mark will be in instrumental in setting this program up initially, within his school and also within the New Plymouth Boys High School – the school I spent 5 years attending from age 12 to 17 yrs old. During our meeting Mark described to me his views on how the selection process of the children could involve developing a criteria where the participants displayed attributes such as: a certain level of intelligence (at least to a level they could understand where they were going and what they would be experiencing), the ability to empathize, the ability to communicate their experiences in Cambodia with their community upon their return to New Zealand, and they would be selected from environments or backgrounds where opportunities such as this may not normally be available to them. For anyone who supports my climb or donates to the CAI or HUMANEITY organisation, I like to try to give something back. Attached below you can see a letter from the Tambalog school here in Singapore, who very generously donated S$200. In return I will be giving these students a presentation on climbing Everest and also show them the equipment and clothing I will wear on the mountain. I have so far managed to raise around S$3000 for the organisations (including S$1000 for the Christchurch Earthquake relief fund), from holding events here in Singapore (e.g. 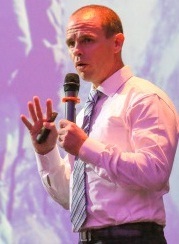 6 nations rugby evening and the Expat Living Presentation Evening held at 1-Altitude). 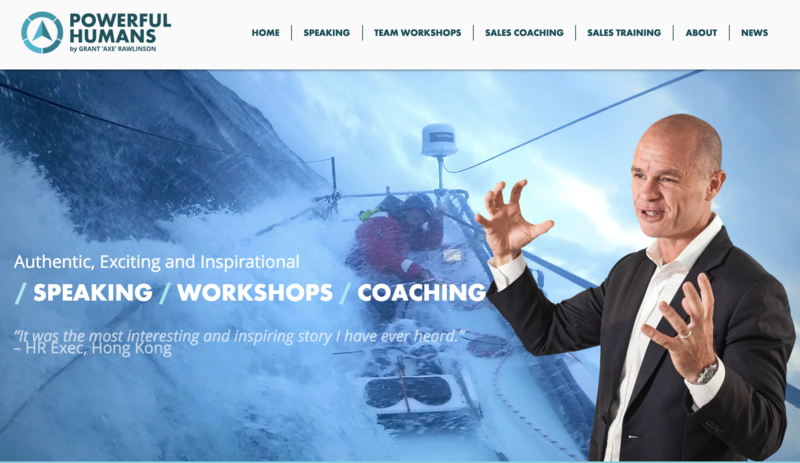 There will be one more presentation and auction evening to be held at the Singapore Cricket club on Friday 1st April, just 5 days before I depart for Everest. My target is to raise around S$20,000. I personally am committing around 80% of the money I raise to the HUMANEITY youth development program and 20% to the CAI. However which organisation you want to donate to, and how much you want to donate is completely your decision! 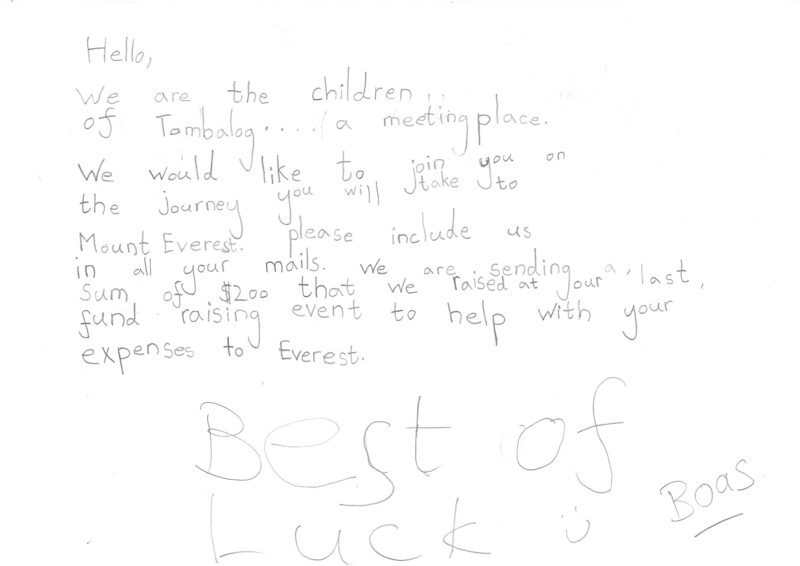 I leave you with the letter written by the children of Tambalog school. Posted on March 10, 2011, in Everest 2011. Bookmark the permalink. Leave a comment.